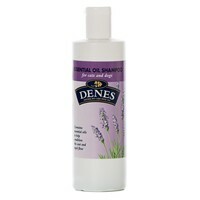 Denes essential Oil Shampoo for Cats and Dogs is an all-purpose shampoo that can be used on a regular basis. Containing many natural herbal ingredients, Denes Essential Oil Shampoo is excellent for helping to keep your pet’s skin and coat in top quality condition. Also, due to the natural ingredients, this fantastic shampoo helps with common skin problems and repels fleas and other similar parasites.